Poland is a fitting setting in which to speak about the dangers of a ‘clash of civilisations,’ since no other country has experienced the horrors of human cruelty so brutally. The country was targeted by Hitler for mass annihilation, with only a remnant of its people to be preserved to act as slave labour for the Third Reich. It was occupied by the Soviet Union and brutally cleansed in waves of executions to remove those whom Stalin deemed a threat to ‘Soviet values.’ And it was chosen by Hitler as the site of the largest factories of mass murder in history: Chelmo, Belzec, Sobibor, Treblinka, Majdenek and Auschwitz. So Poland knows something about the clash of civilisations. Not surprisingly then, it is a Pole who can best help us to understand how the horrors—not only of Auschwitz but also of the Soviet Gulag, Cambodia’s Killing Fields, Mao’s man-made famine, Rwanda’s genocide, and many other stains on humanity—do indeed result from such a clash, but not in the way Trump expressed it. Andrew Lobaczewski was a Polish psychiatrist who observed the brutalisation of Polish society at first hand when Hitler’s Nazis, and then Stalin’s Bolsheviks, forced their violent ideologies on his homeland. What Lobaczewski recognised was that the real division in values and behaviour was not simply between Germans and Russians and Poles, but between people of all nationalities who abhorred the cruelty and violence around them, and those who embraced it. He realised that the fundamental ‘clash of civilisations’ was based on psychology, between a majority of ordinary people and a small but highly influential pathological minority. 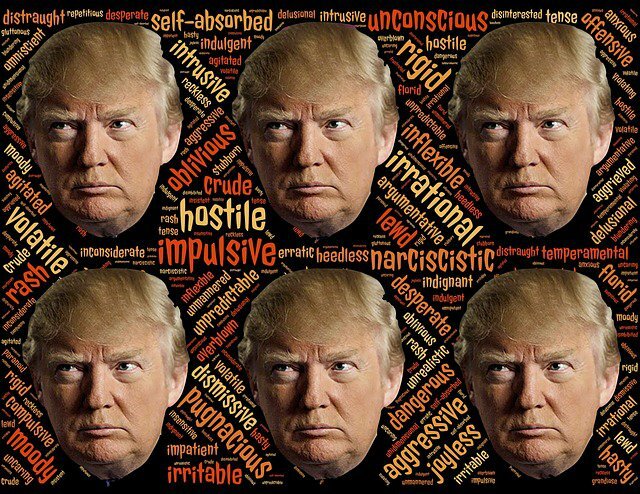 This small but active minority are those who suffer from dangerous personality disorders, namely psychopaths, and those with narcissistic personality disorder and paranoid personality disorder. These disorders render those affected essentially devoid of conscience. And as the psychologist Martha Stout spells out, the presence or absence of conscience is perhaps the deepest human division, arguably more significant than intelligence, race or gender. How would Lobaczewski have understood and interpreted Trump’s Washington and Warsaw speeches? Russian and American journalist Masha Gessen has observed that Trump’s ability to produce an endless stream of common sense-defying statements—the gap between the world Trump seems to inhabit and the world as most of the rest of us understand it—makes his pronouncements extremely difficult to absorb. His endless lies and hypocrisy prompted David Frum of the Atlantic magazine to remark that the values Trump defended in Warsaw such as human rights, the rule of law, gender equality and press freedom are precisely the values he puts at risk in his presidency every day. Imagine for a moment that what Trump was referring to by ‘our values’ were not the norms and values of democracy (as Frum was assuming), but the core values and beliefs that he himself holds with the fiercest conviction: his belief in his own superiority, and his rights to unfettered power; to act impulsively in his own interest at all times regardless of the consequences for others; and to crush any opponent who threatens him. What if the ‘violence against the innocent’ he referred to was not the violence that is visited on the poor and vulnerable in society, but the violence that he himself must suffer daily as he sees it, attacked as he is from every corner—by the media, the justice system, the majority of Americans outside his political base, and the legion of ‘leakers’ who feed the ‘fake news’ with an endless torrent of accusations. What if Trump’s agenda is the same as that of the authoritarians of history about whom Lobaczewski wrote, and the agenda of the strongmen of the present who Trump admires? What if Trump is in office, not to serve his country but to protect his own position of power, while enriching himself and his family along the way? Analysing Trump’s first six months as President from this perspective allows us to see how close he may be to achieving his primary objectives. While Trump’s critics take comfort in his lack of legislative successes to date, such coverage may simply be ‘background noise’ which masks the degree to which he is succeeding in what matters to him most—namely establishing himself as the head of a dynastic, autocratic pseudo-democracy. Ruth Ben-Ghiat, a professor of history at New York University and an expert on authoritarianism, has written that Trump is already close to accomplishing the most important things an authoritarian leader must do in order to survive over the long term. He has cultivated ties within the structures of government that are based primarily on loyalty to his person rather than to the rule of law or democratic norms. He has stoked the flames of a cultural civil war that benefits him by polarizing the country and mobilising his base. He has conducted a relentless campaign aimed at discrediting institutions and individuals who might hold him accountable. And he has been directing a concerted effort, begun during his election campaign and carried out in parallel with (if not in direct collusion with) Russia, aimed at undermining the American people’s faith in the entire democratic process. If this is indeed Trump’s vision and should it come to pass, elections will continue to be held, but there will rarely be any doubt about the winner. In the absence of sufficient checks and balances, the continued gerrymandering of districts, increased voter suppression, the dominance of special interests in campaign financing and the manipulation of information could allow the Trump dynasty and its backers in the Republican Party to remain in power for decades. Trump will have succeeded in bringing about the demise of democracy in the USA. In response I can hear Lobaczewski’s voice echoing in my mind: the fundamental question of our time is indeed whose values will prevail: will it be Trump’s values or our own?